Family Nurturing Center is recognized as a national trainer/consultant for the Nurturing Parenting Programs and offers a wide range of education, awareness and skill trainings to professionals and community groups. Customized workshops, trainings and in-services on a fee for service basis and can last anywhere from one hour to several days. Direct your questions to Carol Lapin, Director of Prevention Services. All trainings are scheduled through Carol Lapin, Director of Training or 859-538-1614. Continuing Education Units are available from the OH Social Work Board and KY Board of Social Work. Carol Lapin is the Director of Training at the Family Nurturing Center. 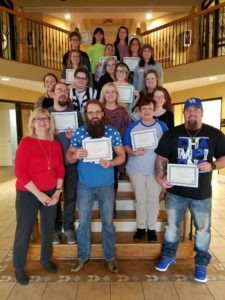 She has a Master of Science in Social Work and for more than 20 years, Carol has been teaching, training, and sharing the philosophy and skills of the Nurturing Parenting Programs® for adults, children and adolescents in Northern Kentucky and Cincinnati. In 1998, she received the recognition of Dr. Stephen Bavolek, principal author of the programs, as a National Trainer of Trainers in the Nurturing Parenting Programs.